Let's see what's on my desk. Hmmm. 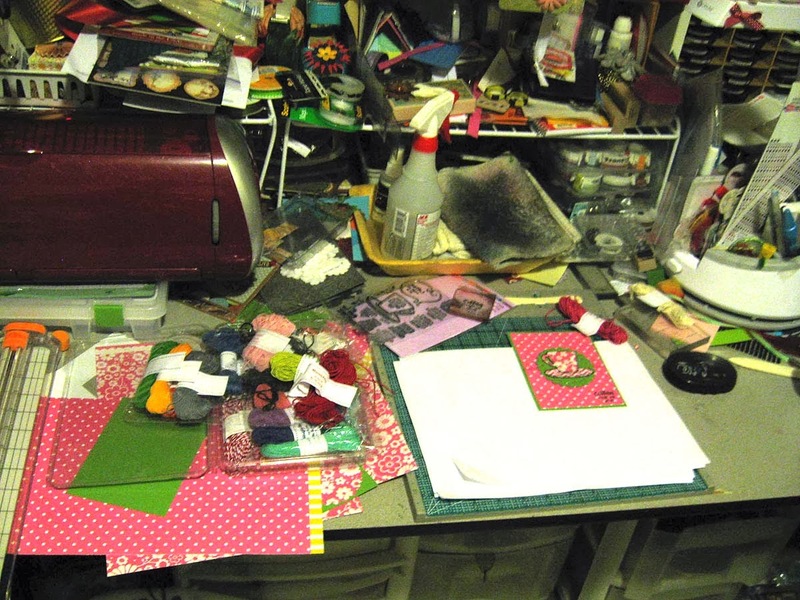 Left to right: paper trimmers, paper, twine, stamps, stamp area with card I'm working on, more twine, ink pad, bone folders... Yeah, busy. I'm working on my 4 card samples for my March class. I have to have them all done with directions and supply list by Monday! I've gotta get it in gear but I just purchased the stamps and paper this past Monday. I'm still needing some Valentines and adapted a cool sketch from 52 (Christmas) Card Throwdown for this one. I made my Christmas card last Saturday for the challenge and just kept on going.... like the Energizer Bunny. 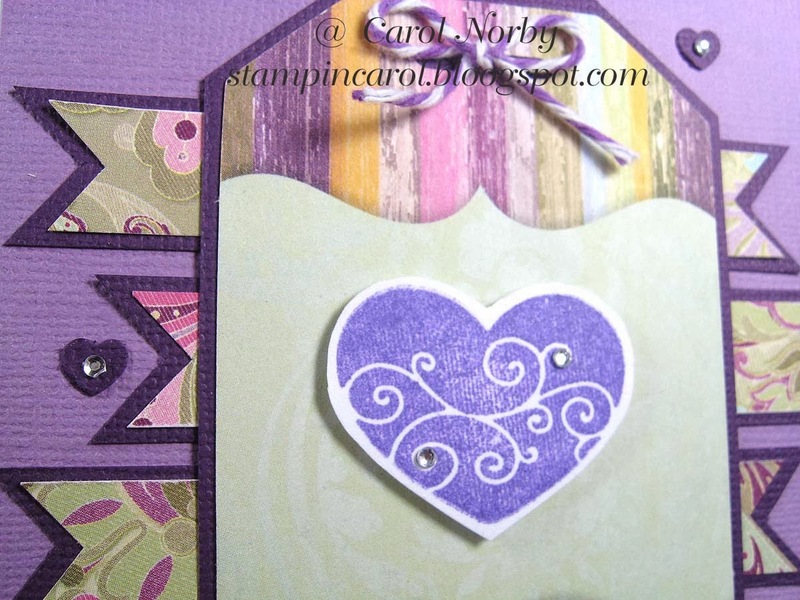 Now, believe it or not, the stamped heart is very purple! I don't know why it comes out mostly blue when taking the photograph. I tried to fix it in Photoshop but I ended up with some real wonky colors! Oh well. Pattern paper is from a collection called Maggie which I purchased when The Angel Company was still in business. Stamped heart is from a set called Hearts by Inkadinkado. I added little hearts from a small punch then added a bunch of itty bitty rhinestones. And a little bow made from twine from The Twinery and I'm all done! How's that for a non-traditional Valentine? If you're so inclined to leave a comment, great! If not, that's ok too! But please go to the Stamping Ground and check out other desks and projects when you're finished here. It's great fun and you will get inspired! This is a sign hanging at our back door. Yep. 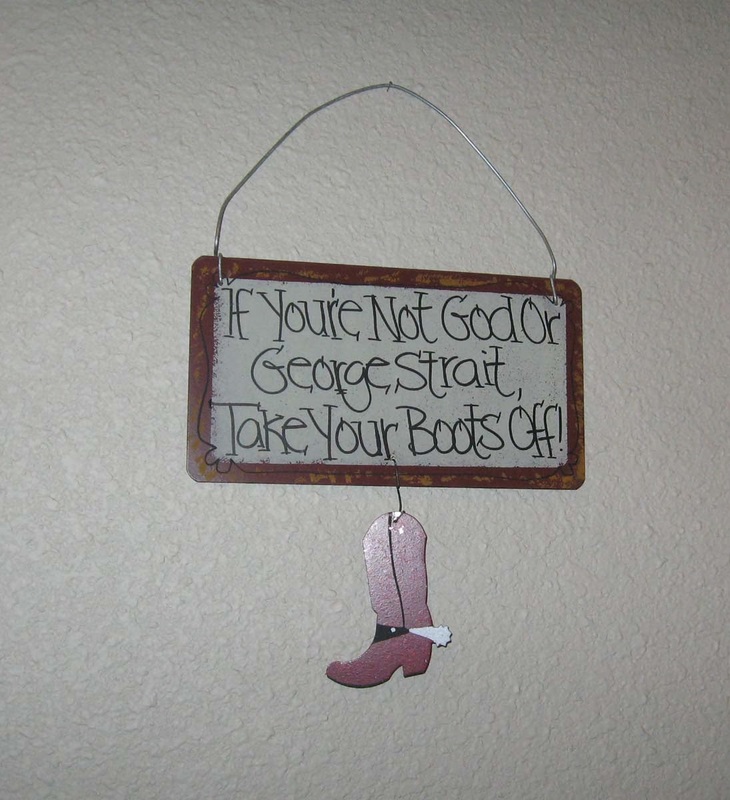 He can keep his boots on in my house. LOL! Hope you all have a great week and, if you're so inclined, please leave me a comment about my post. Then be sure you head off to the Stamping Ground and check out all the cool work areas linked there! I hope to visit desks tonight and on Thursday as we'll be taking my mom to the hospital for a blood transfusion on Wednesday early, all day. She has MDS, a pre-leukemia, and the aranesp shots that she's been taking are not working. The doctor said this is the last thing we can do. Do appreciate your prayers. I am so glad you explained George to me as I had no idea what your sign meant. What a clever gift and thoughtful. Belated birthday greetings. What a great sign on your door! Love your purple valentines, makes such a change from red and pink!! Oh your lucky thing, I love George Strait too and all country music!! Have fun. Sending best wishes for your Mum. Many many happy returns Carol. Of course, I have to go look up George now, but am thrilled for you, what a lovely gift. 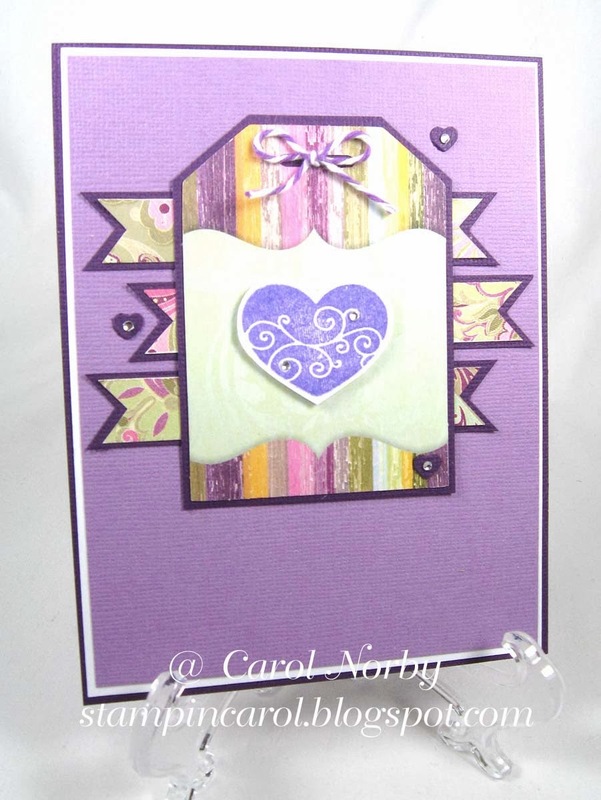 I love the mounting that you've done for the card, such nice delineation and makes the lovely papers really pop. I'm looking at March workshops too,no wonder the weeks go so fast! Am holding your Mum in my thoughts, what a trial for you all. I enjoyed reading your post--Your desk looks like mine! Hope you had a wonderful Birthday, and I pray your mother gets better. Such a cute Valentine's card, love the colors. Happy birthday, hope you enjoy the concert! Thanks for stopping by my blog earlier and for the nice comments. Hope you had an awesome birthday. Love the non traditional Valentines card. Sorry I missed your birthday, but I adore that card. I like everything about it from the heart to the background papers. I had to laugh because, although I'm not a country music fan, I knew how the British and Aussie gals who didn't know who George was felt, especially when they use words I am unfamiliar with. Guess we should remember, a BOOT in their world is the trunk of their car (GRIN). That's why they call them boot sales. Thanks for dropping by my snowy place already and happy very belated birthday and of course, happy belated WOYWW from #1.